Time for some general updates from the Gignacery! We made it through Week 1 of Band Camp. Seriously, as I mentioned in my July wrap-up, band camp is insane here. It’s band camp with a capital BC. This week was just a bit over 40 hours of practice, including one day that involved three sessions between 8am and 8:30 pm, for a total of ten hours in a single day. Sheesh. And on top of all the hours, we had to go pay $350 in fees yesterday just for Morrigan to be in band. What happened to the concept of free public school? Not here. Here it’s all about Winning. The other two boys finished up with summer school. So they at least get a few weeks off. 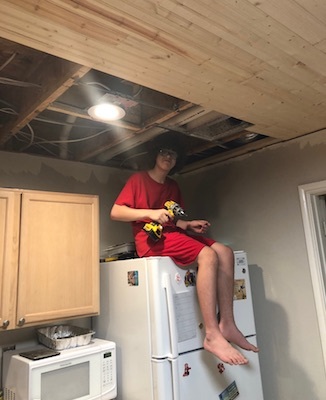 There was, of course, the incident yesterday when Jason was hanging cabinets and slipped off the stepladder. His knee went through the top of our glass-top stove. Thankfully he wasn’t hurt, not even a scratch! 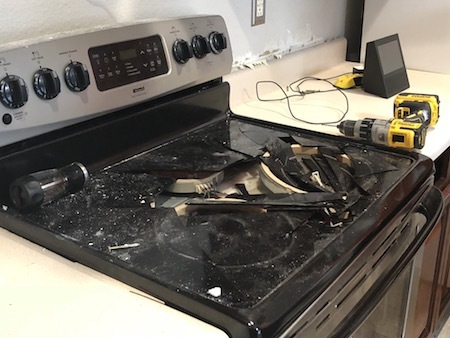 Unfortunately, the stove didn’t fare so well, and we had to scramble to figure out what to do next. Sigh. In my personal world, I’ve been a bit up and down this week. There was the funeral on Monday of course, and then fretting about the state of our house and me not being able to leave/run errands/pretty much anything during the day since I had to be home for whenever our contractor could come over. Also, still adjusting medication, so I was prone to bouts of depression or panic. In the second half of the week, I did manage to start exercising again, which helped. We’ve had a few highly unusual cool mornings (70 degrees instead of 80) and I took advantage of that with some long walks. That didn’t help the overall chaos and emotion-explosion, but at least I wasn’t antsy on top of it all, right? Unfortunately, after a month of respite, insomnia has reared its ugly head in the worst way again. And still no word from the sleep center people about a possible APAP. Yesterday was a big day for us, too. We had a large family party to celebrate two things. First, my grandfather is turning 90! Second, my grandparents are celebrating their 65th wedding anniversary. Despite everyone flying in for the funeral less than a week ago, we were all back for this grand celebration. A big giant family reunion to celebrate something lovely this time. It was really nice. There were some family members I hadn’t seen in almost a decade, and the decorations were lovely, and one guest (a professional photographer) set up an area to take group shots. It was a big whirlwind of a day, but lovely in every respect. A good note to end this week. That sounds like a crazy week for anyone! Here is to another respite from the heat, a less chaotic week of renovations and band camp! So far, no good. Our contractor, who was supposed to be here Friday afternoon, Sunday afternoon, and first thing this morning, has yet to show up on any of those days. So we’re still plugging along doing it all ourselves. I’m with Michelle who commented on her blog about $350, that that is ridiculous. Do they have scholarship opportunities for families that can’t afford that? I know in our area, they do that, I think. 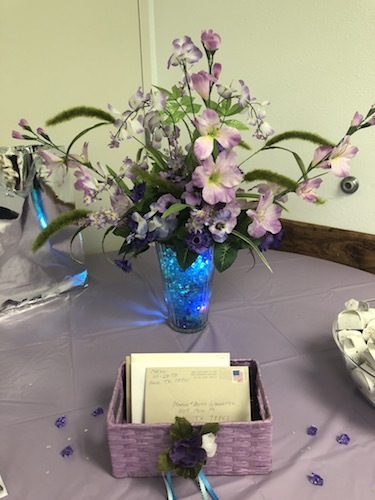 Happy belated birthday to your grandfather and anniversary to your grandparents. That is a great way to end the week. Hope this week goes as well for you. I think they accommodate people with payment schedules instead of scholarships. You shouldn’t have to go into debt to be in band. It’s not okay. I can’t stand the band here. It’s unfortunate, because it could have been such a good experience. Instead, it’s turned into more of a bragging, winning competition that makes the band kids think they’re the center of the universe. Your life is always so interesting and eventful. 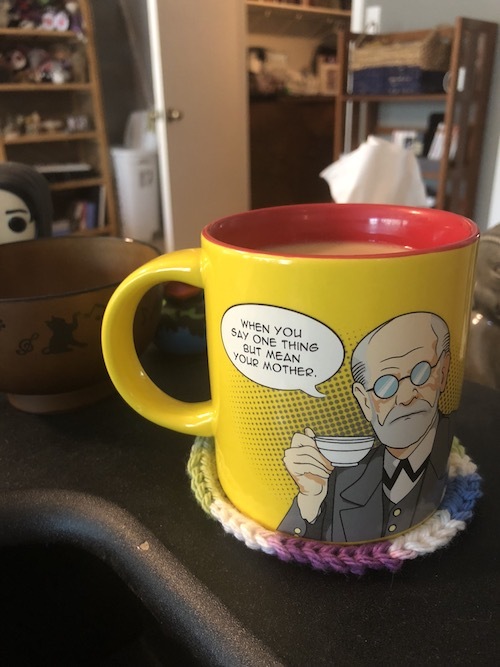 And my god I love that Freud mug! I’m so sick of my life being eventful, ha! I need some peace and quiet and calm. As for Freud, this mug only shows a tiny portion of its glory. The packaging comes with phrases like “The breast mug ever” and the other side of the mug says “Freudian Sips.” Years ago, I used this mug in my counselor’s office in Boston, and I knew I had to get one for myself.